We are obsessed with all things Peacock in the Desert: The Royal Arts of Jodhpur, India! Even SAM Shop is getting in on it and is bringing second-generation Indian textile designer Parekh Bugbee for an in-store trunk show on December 8. We sat down with Payal Parekh Bugbee to discuss the tradition of textiles in her family, sustainability, and spectacular colors. See these beautiful scarves in person while you chat with the designer and sip on some complimentary chai courtesy of Jaipur Chai. drop by anytime between noon and 4 pm and get a jump on holiday shopping! SAM: How did Parekh Bugbee first start and where does the name come from? Payal Parekh Bugbee: The initial roots of Parekh Bugbee began in 2011 when I met my husband-to-be during a work trip to Thailand. He’s a photojournalist and also does projects for global health NGOs. I didn’t know how our relationship would blossom but before long he traveled to India to formally meet my father and ask for my hand in marriage. At the time, I’d returned from living in New York City where I did undergrad studies at the Fashion Institute of Technology and had re-located to Mumbai to train under my father. Since the 1960s, my father had worked on collections made for many international designers. These were big name, well-known design houses and they put their labels on everything produced, so at the end of the day customers really wouldn’t know that the pieces were initially designed and manufactured by him. To this day he is a very humble artisan and doesn’t mind. Growing up in India, I spent many years observing his print mastery and artisan skillset. As such, I developed a real zeal for a career in textiles. Parekh Bugbee, is a combination of my maiden and married names, the fusing of East and West cultures merged into one company. The prints and textiles we make merge traditional and evergreen Indian designs with modern and contemporary motifs. Have you always wanted to be involved in your family’s business? In truth, I always had a gut feeling at a very early age that I was destined to carry forward what my father had created but the mystery was what precise form it would take. As a teenager in the early 90s, my parents sent me to New York City to join my elder sister to study and pursue a career. Photography initially grabbed me passionately and I became adamant that I wanted to be a fashion photographer. These skills later proved useful to document and promote my father’s textile works and that was personally rewarding. When I returned to India after college, I worked as a photographer shooting textiles. It was an interesting journey—in India, the boy children usually inherit the duties of a families business but my father never had a male offspring, so it was natural that he wanted his daughters to understand his industry and carry it forward. After spending one month in the office agreeing to work with him, I realized that it was connected to so many lives and it gave so much back to everyone who was involved in producing these fine textiles. I came to understand it as an ecosystem within itself from concept to completion. 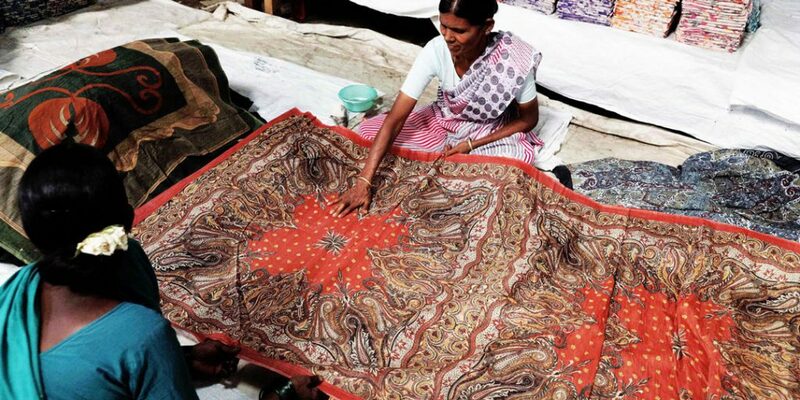 Most of the artisans are from different cities and villages around India. In simple terms, the work and the skills they employ make it possible for their kids to have a good education, a solid home, and modest savings for the marriage of their children. My father over the years built apartment units on the acreage around the factory so the artisans and their families could live close. A mango orchard was planted not long ago and he started a sustainable organic garden as well. 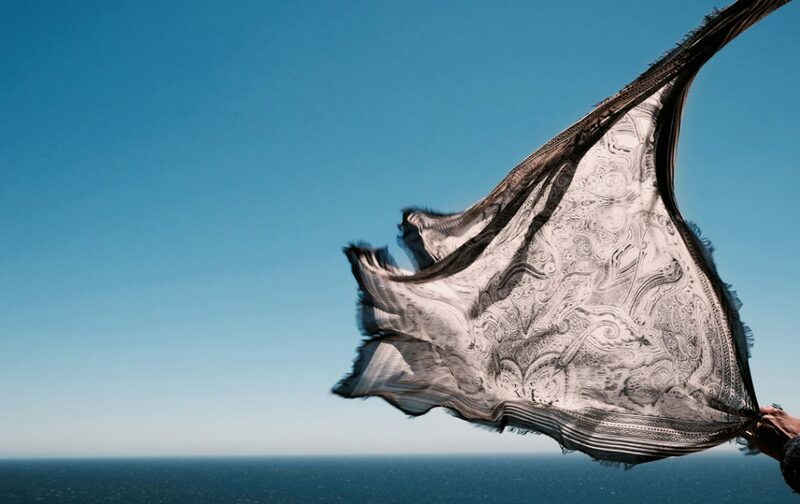 To look at the whole picture is necessary to understand what goes into making these textiles. I understand Parekh Bugbee uses organic and natural dyes. How do you get the spectacular colors? We have a long process for drying the fabrics. My father refers to it as ‘cooking the textiles.’ After the silkscreen printing process, which is accomplished by a meticulous application of layers upon layers of color, the fabrics are run through an extremely high-temperature steam and then dried in direct sunlight for at least two days. This direct sun exposure ensures best results for fastening the color onto each textile. 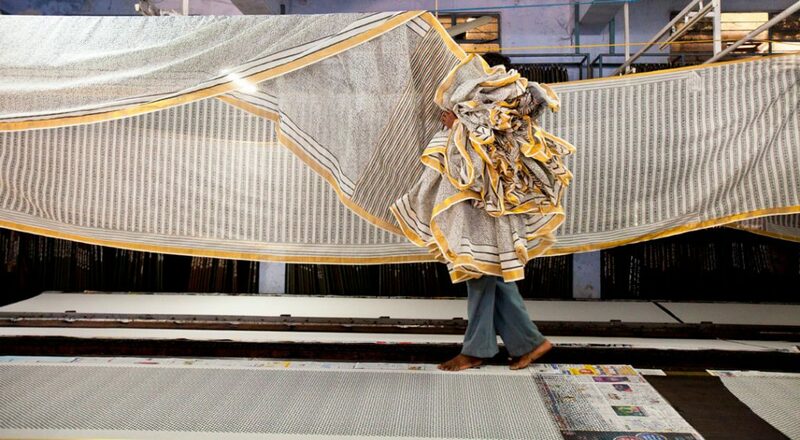 Do you see changes in the way textiles are produced in India that are considering environmental implications? Textiles in Asia are a very large and complex industry and even in India there are many approaches to this art, but in our practice, we try our best to be very environmentally conscious. Our entire factory is made out of recycled materials—floor to ceiling—and for as long as I can remember my father has been all about ‘zero wastage’ when it comes to the production line. A while back he created a sophisticated water filtration system which essentially recycles all the water used in the textile printing process to eventually be used in the vegetable gardens. All of the scarves are so beautiful! How many do you keep for your personal collection? These textiles have a life of their own and a story behind them. I feel that with time they will only be more valuable as most wearable textiles are now produced cheaply by machine only. These are made by hand every step of the way. That is now rare. And that is why they will retain their special nature. Honestly, I do have a very wide range of my favorite silk scarves and shawls. I have them tucked away in a closet and someday it will be a great honor to pass them on to my child. I really believe that these textiles are not just mere pieces of fabrics, they are textile jewels that will never go out of fashion.